Died 17 May 2004 Las Vegas, Clark County, Nevada, U.S.A.
His obituary as published in the Salt Lake City Newspapers on Friday, May 21, 2004. 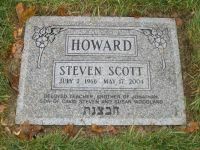 Steven Scott Howard, age 37, son of David Steven Howard and Susan Woodland Howard of San Jose, CA, brother of Jonathan Philip Howard, of Prospect Heights, IL, grandson of Harry Henry Howard, and great-grandson of Abe Rafael Horwitz, died of natural causes at his home in Las Vegas, NV on Monday, May 17, 2004. Steve was born July 2, 1966, in Sierra Madre, CA. He graduated from Lynbrook High School in San Jose, CA in 1984. He attended the University of Southern California where in 1993 he received a BA degree with double majors in Political Science and History. He earned his teaching and CLAD credentials from San Jose State University. 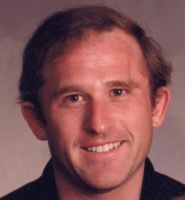 He was a middle school teacher in Los Altos, Santa Clara, San Jose and Gilroy. He relocated to Las Vegas two years ago with the intention of continuing his teaching career. He truly loved his students. Steve loved performing as a public speaker and as an actor. He was taking classes in movie making and acting at UNLV, where he had a lead role in a student film made by one of his classmates. He enjoyed his participation with the Las Vegas Improvisation Players. Steve also loved sports, especially baseball and hockey. A devoted fan of the San Jose Sharks he was thrilled to be able to personally attend second and third round games in this year's Stanley Cup playoffs. At the time of his death the Sharks had regained momentum and looked like they had a good chance to win the cup. He died a happy fan. Steve was proud of and loved his family. He is survived by his brother Jonathan Philip Howard of Prospect Heights (Chicago), IL; parents, a large family of aunts, uncles, cousins, and his spoiled 15-year-old cat Rufina. Memorial services and interment were Saturday, May 22nd at Wasatch Lawn Mortuary, 3401 Highland Dr., Salt Lake City. Steve received a BA degree from the University of Southern California with a double major in History and Political Science. This he accomplished after recovering from a brain tumor, which was discovered and removed in 1991. He went on and received a teaching credential from San Jose State University. He loved teaching middle school. He got beautiful notes from his students at the end of the year saying how he had helped them and changed their lives. Steve was always positive no matter what happened to him. His disabilities made it impossible for him to be a full time teacher. He became a substitute teacher. He moved to Las Vegas where they needed more teachers. He loved his job. He loved to write and was very talented. He always wanted to make movies. He was a wonderful actor and had a quick sense of humor. He enjoyed working with the Las Vegas Improvisational group. He took acting, movie making and writing classes at UNLV. He came to San Jose on Saturday, May 8, 2004, and stayed until Thursday, May 13th and went to two Stanley Cup playoff games. His mother went to visit him on Monday, May 17, 2004, to go shopping with him to help him buy a home. He had been sending emails to his parents until 2:30 PM and when his mother arrived at his apartment at 7 PM he had passed away. He was only 37. He died happy with a long list of projects. We loved him dearly and we will miss him forever. Died - 17 May 2004 - Las Vegas, Clark County, Nevada, U.S.A.
Steve at 21 months. Check out those abs! Steve Howard with beard and dog- KC. Missing description g Elko'd for many years afterwards. 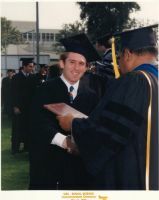 Steve Howard graduated from the University of Southern California (USC) in 1993 with a double major in Political Science and History. This was a tremendous accomplishment in light of his medical history. 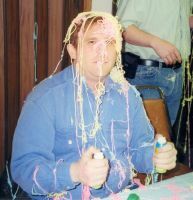 Steve Howard- excellent silly string fighter- you should have seen the other guy. This was taken at his grandmother's 80th birthday party. Steve Howard- Lavon Vernon and Teddy Bear- March 2002. 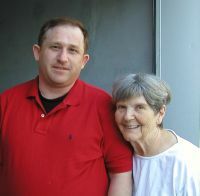 Steve Howard and his grandmother- Mary Vernon- June 2003- Provo- UT at Mary's home. 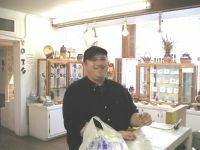 Steve Howard- buying a Mother's Day gift in San Antonio- TX in March 2004. He shipped it to her. He was sure she would like it. She did. 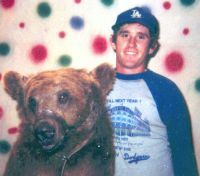 Seve Howard and Vargas Circus Bear. Steve had the nickname of – Bear - from his Burger King days. At Location #1 on map. Click on tombstone photo to see map.